1.Prepare brownie mix as label directs stirring in cinnamon and red pepper. 2.Spray 12 standard muffin tin cups with baking spray; fill cups e full. Spray bottom of second muffin tin with cooking spray; gently place on top of tin with brownie mix. 3.Bake as label directs. Cool completely on wire rack; remove top muffin tin and carefully remove brownie bowls from muffin tin. Makes 12 brownie bowls. 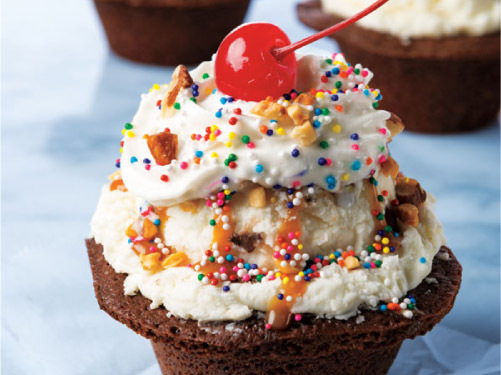 4.To serve, add 1 scoop ice cream to a brownie bowl; add toppings, if desired.